Set the dirt flying in either a Team Subaru-prepared Subaru Impreza RS on our Rally Driving 6 Lap Drive followed by an awesome Hot Lap in the passenger seat! 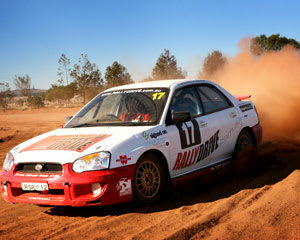 Set the dirt flying in a Team Subaru-prepared Subaru Impreza RS on our Rally Driving 6 Lap Drive. After a safety briefing you'll be suited up in a race suit and helmet then the real fun begins as you are strapped into the driver's seat of your chosen rally car. With a professional instructor in the passenger seat you'll roar off for 6 laps of dirty driving around our purpose built rally track! Once your 6 laps are done you will be securely strapped into the passenger seat and hold on tight as the pro takes the wheel for one awesome Hot Lap! Shout out to the guys at Rallydrive. Awesome experience! It was awesome. I would love to do it again. The rally drive was great fun. Next I want to do a V8 drive of Phillip island. I've already driven at Calder park, that was an awesome experience. Cheers Matt. The guys at the Rally Drive course were amazing! Great attitude and made the experience even better.